It's no secret that I don't really like to cook. Frankly, I don't really like to eat that much either. I am more of an eat to live kind of person, instead of the other way around. That's ok, to each his own, but people who know this about me are often perplexed when I tell them that the kitchen is my favorite room in the house. You don't like food, but you love the kitchen? 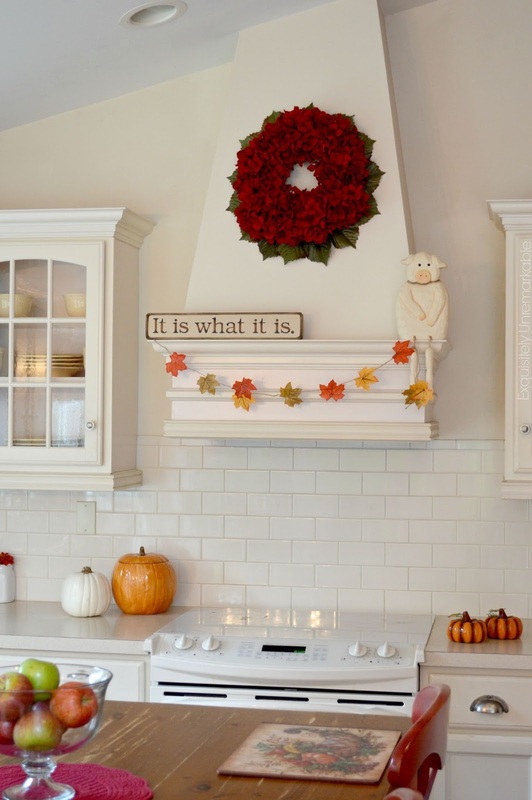 It's really not that big of a mystery, I love the kitchen for the fabulous decorating opportunities, especially in the fall. When it gets cold outside, there's nothing better than cuddling up in my big chair with a pair of fuzzy socks and a giant mug of hot chocolate and hanging out in there. I like it best in the early evening, after the dinner dishes have been cleared away and the kids breeze in and out, grabbing snacks and sharing amusing anecdotes about their day. I put on a little soft music, dim the lights, turn on my candles...yes, turn them on, and settle in. Sometimes, I write. 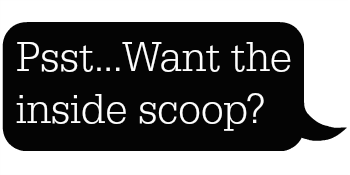 Sometimes, I work on my website. Sometimes, I read and sometimes I just sit and stare at the pretty. My husband in usually in the family room, watching some show about people who are trying to survive in Alaska...or Guam, some without clothes, all of them with a full camera crew and probably within a mile of a McDonald's. He doesn't want to hear that. He just wants me to come in and watch tv with him, but it's hard to pry myself away from my pine server and all of its festive fall decor. Or my hood, the focal point of my kitchen, that reminds me of a hearth. I'd rather look at them than at The Discovery Channel. 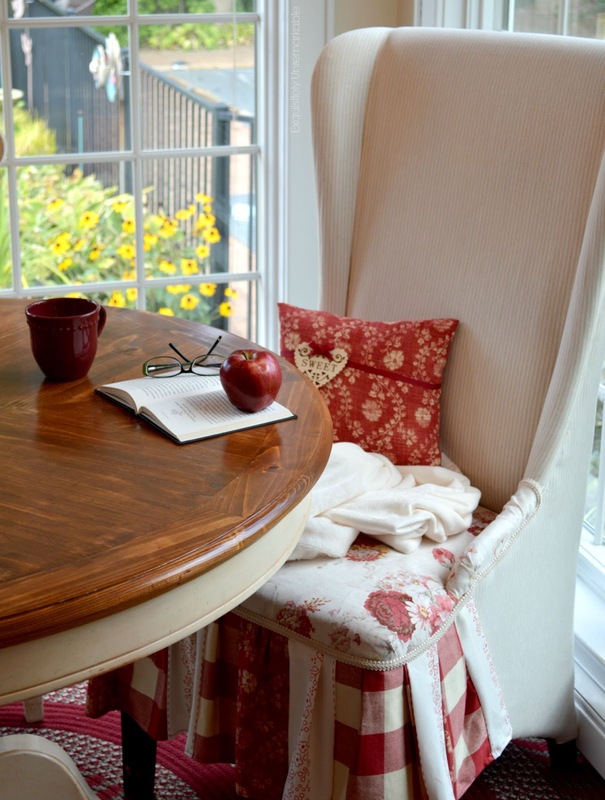 What's your favorite room in fall? Looking for a few more ways to warm up your kitchen this season? Check out these easy ideas and updated decor. My favorite room for the fall, hmm? I guess it would be my dining room which is my favorite room all year long. 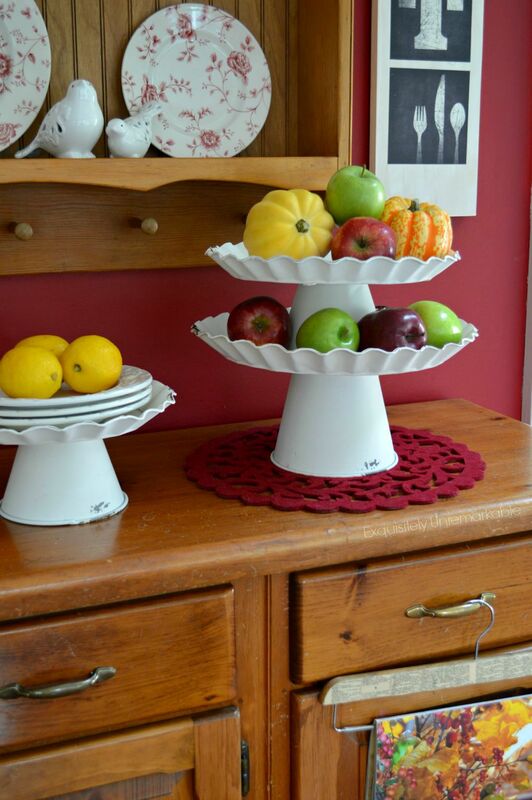 Your Decor Steals cake stands look great. I need to get mine out and style them! Thanks for the tip, Carol! They are so fun. Ahhhhhh love your kitchen and all your fall. I like to do up my dining room for the holidays so that is one of my favorite rooms to decorate. Have a great rest of the week. Thank you, Kris. It's fun to play in this room! I hope you have a great week, too! So pretty, pretty! I would stay in your kitchen long after the meals too! My favorite room in Fall is my dining room. I decorated it in all Fall colors and it is the room that most reflects my style. I want a whole house some day like my dining room. I think my living room is my favorite room in the fall, with the stone fireplace. But I'm not sure yet since this is my first fall in my new house! I love your house, Kim. All the red, the roosters, that wreath on your hood vent, it's all gorgeous. Thank you! My kids always tell me that we have too many roosters! I tell them that there’s no such thing! ;) Your stone fireplace is quite stunning, I bet you will enjoy a ton of cozy fall nights staring at that pretty site!! I've always loved your kitchen, Kim, and I can see why you enjoy your cozy spot in your pretty chair. I think my kitchen is my favorite too - at least it's the one I change things around in the most often and it's the most fun to decorate for holidays. Thank you JoAnne! I fought long and hard to get that chair. My husband thought it would be too big for the room. Guess who likes to sit in it all the time, now? ;) Enjoy your own fabulous kitchen! 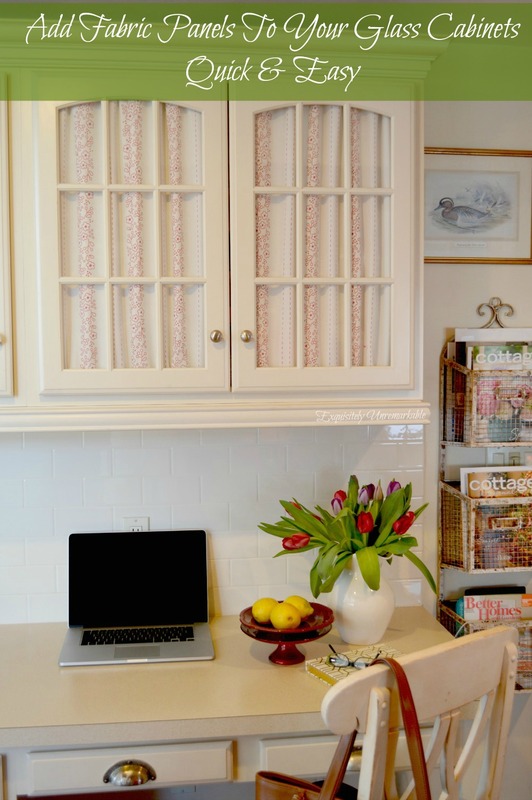 I don't blame you at all for wanting to stay in this cheerful beautiful kitchen! It is what caught my attention when I first "met" you here, that and your love of red. And your not loving food--is that contagious? Because I'd sure love to be exposed to that! 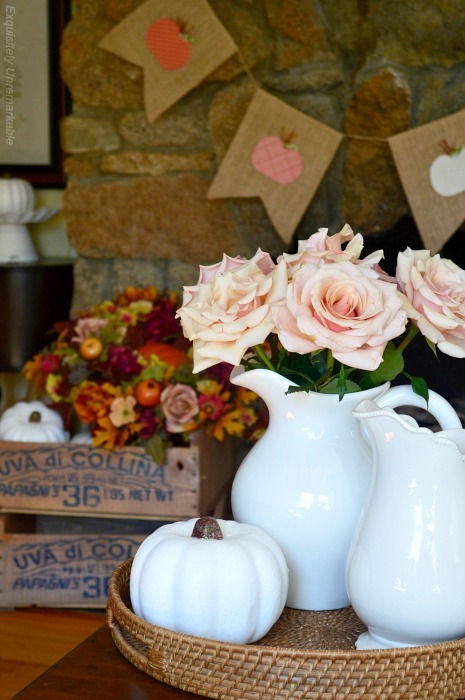 My favorite room in the fall is also my kitchen--the scent of cinnamon and apples and pumpkin spice! Food! Haha, Dewena, contagious! You are a funny girl! Ok, maybe I should rephrase that, I like food, it just doesn’t like me. You know those commercials where people try to eat tacos or a hamburger and then end up fighting a life sized version of the food? Yeah, that’s what happens here. Had it my whole life…I was that kid…the tummy ache girl. Lots of fun at parties! ;) I get along with home decor accessories much better! Kim - It seems we not only have a love of red but are less than passionate about food and cooking- I have a plaque in my kitchen "The Only Reason I Have a Kitchen is because it Came with the House"! But I spend all my time in my kitchen as my computer lives there so like to decorate that room a lot. Food hates me too since childhood- I will send you a PM about info that helped me- might work for you too? Hi Kim, love your kitchen for fall. So warm and cozy. I love your wonderful jar pulled up to the table. The perfect snuggle up spot. I'm not sure, I have a true favorite spot in my home, but sitting in the living room by the fireplace or the sofa snuggled up with a good book or cup of hot chocolate is probably my fav followed by my kitchen since I'm there most of the time!! Love your tiered cake stand. Everything is gorgeous. I enjoy the kitchen too. I agree with Dewena about the food part, then a read your reply. :-( Sorry about your tummy aches. And yet, candy, I can eat! Amazing how that works isn’t it? ;) I would be perched in your entryway all.day.long. I grew up in a house where the living room and dining room were one big open room and the view was great. I totally get it! :) Fall for as far as the eye could see! I just love how you decorated. I love to eat, too much really, but I only like to bake. I also love to sit in a comfy chair with a hot cup of tea or cocoa and this time of the year is the best. i am right there in your kitchen with you! that would be my spot too! i had to LOL! i've often thought of the camermen and crew too on those silly shows. filming their GREAT ASSENT!!! uh oh. did i spell assent right. it looks funny. i love the idea of flameless candles! now i will definitely get some. i followed the link to your past post showing them... oh! so beautiful! i don't do well with scented candles at all... allergies. can't breathe. eyes water. so i use little beeswax tea lights. but i love the look of those flameless ones. i'll let you get back to your cocoa. i'm eating a heart healthy frozen dinner. of course i nuked it. I am a big fan of those flawless candles. Click on. Click off. Perfect! I love your " fall touches . . .
And your thoughts . . . I guess I like my kitchen, dining area the most . . . Touches of warm colors here and there and usually the fragrance of one soup or another tempting me/us to try. Cooler days, early darkness seems to be here and the kitchen seems to enhance us and brings comfort and warmth to our gathering place. Now that the kids are grown and I live alone I have really gotten out of the habit of decorating for the seasons and even the holidays. Last year I didn't even get the Christmas dishes out. Maybe I need to dust some of that stuff off and get to it. Right now the decor at my house could be defined as "garden" as I have potting mix, containers and seeds on every horizontal surface that wasn't already covered with canning equipment. The joys of a small house. I am starting to move baby plants out into the greenhouse so hopefully this is short lived. P.S. I found your thrifting post. Nice. I remember when we all moved out, my mom would not decorate. Ah, it's just too much, she would say. We would all go over on a weekend and put up her tree and take out a few decorations. I never understood it, but now I get it. It's a lot of work! I have cut back a lot. I want a little accent to welcome the season, but not so much that it becomes all I do for the season! ;) Glad you liked the thrifting post...and your farm inspires me, so we're even! 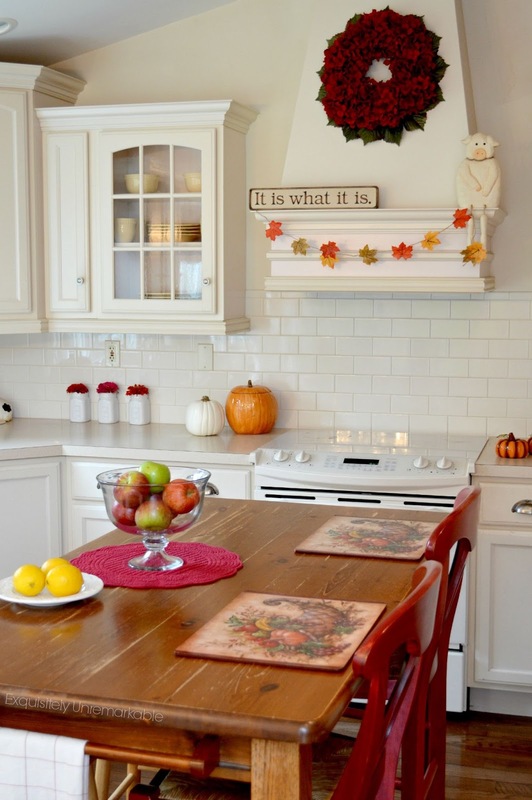 Kim, I love all of the fall touches in your kitchen! And I would never want to leave that chair either, especially for "dating naked"...LOL. I tell Edward the same thing about a McDonald's within arm's reach and he doesn't want to hear it either...but it's true...LOL Like you, I eat to survive, but I do love to cook and bake for others. For me, sitting near the fireplace, reading a good book and having a cup of hot chocolate near by is awesome....early evening or early morning...before the world wakes up! 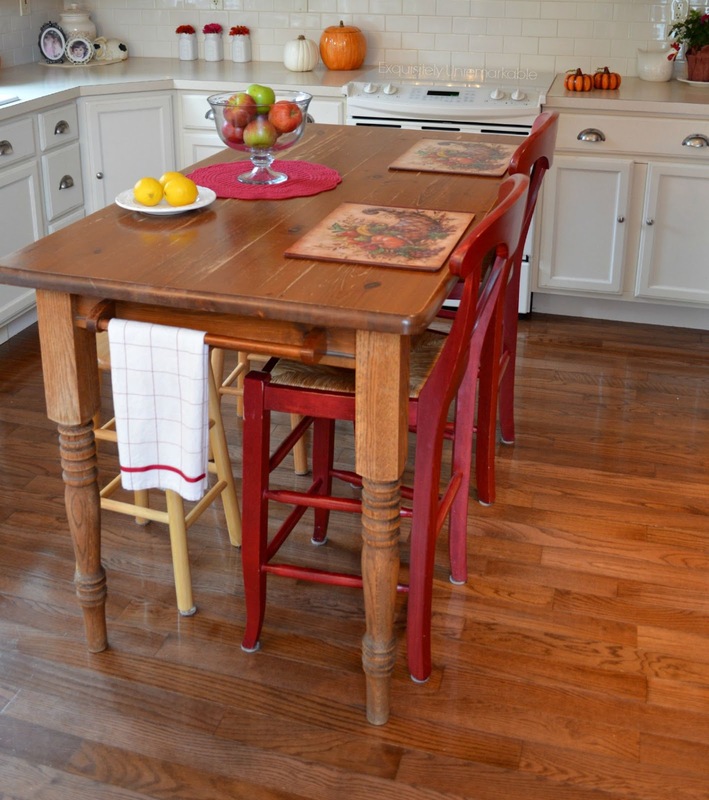 Your kitchen, and little area with your chair are just perfect Kim, and I don't blame you a bit for indulging in quiet time, and visiting with your kids, or doing whatever you desire in there, lol! Favorite room to decorate - well, that would probably be no room at this point. I am still trying to get organized in our cozy 700 sq foot home, and don't have room for much other than essentials. I suppose I could find a pumpkin or two to put out, lol! You may have a cozy 700 square feet inside (which I know is challenging with a family, but it just sounds so charming), but you have the most amazing outdoor space, complete with feathered and furry friends. Thinking about your open skies and fabulous forest always makes me smile. That sounds perfect to me! Hmmm, my favorite room...that's a hard one for me right now because almost all of our rooms are a mess from the kitchen reno. If I had to, I guess I would say my living room. I like to sit on my couch with my candles lit and dog on my lap and watch the trees out my big picture window. Love your kitchen Kim, and I don't blame you one bit for wanting to hang out there. Men's tv shows!!!! -gigggles- Yes, we "do" those here too. Along with every DIY show known to mankind. And searching for new homes, all over the globe. Actually, I like these. One can sit there and bemoan how the silly people always have to "do over" every thing. Like... Live with a not perrrrfect and newwww bathroom? On no, they simply can NOT do so!!! Realllly!!!!!! 'Course, all the while, I am on IG or reading. I do love my kitchen pretty much year round. I love to cook & to eat, I love the gorgeous views & just how pretty & organized it is. My favorite room in the fall though is my living room.. It's the only family space unless you count the screened porch, we don't have a den or family room. We have a wood pellet stove that we use on cold days & I love sitting in the evenings watching the fire, reading, listening to music or whatever. I'm decorating for fall this week & I'm excited how nice it's looking. I bet fall looks great with your new interiors, Jenny! It’s awesome when your vision comes to life, isn’t it? Happy October, almost time for that fire! Ah, the porch! Good choice, Deb. I like it out there, too! I think your kitchen is just so charming, Kim! It's easy to see why it's your favorite. My first instinct would be to say my kitchen is also my fave, but as I ponder a little longer, I have to say it's my sitting-dining room. That space is the one where my most special treasures have their home. It is the space that never gets messed up, so it's always the perfect place to sit alone or with company. Oh a room that never gets messy? I want one of those, Carol! It sounds just divine! 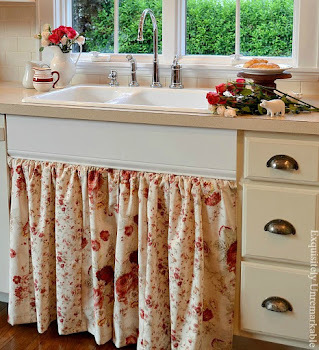 Your kitchen is beautiful, I love all the white with the pine and pops of red. Your pine hutch and island are gorgeous! My favorite room in this house is our upstairs living room - it gets the most sun and is a cozy room in the fall and winter! We get a ton of sun in here, too Kimberlely, I think that is what contributes to my warm feelings! Sunshine is always a good thing! Thanks for the sweet comment and visit! I love your kitchen too and it is amusing that you don't like to cook! I have the same set up cake stands and mine are from Decor Steals and I love them. I will come over and cook anytime in your kitchen! Decor Steals is my new addiction. Dangerous! I love your kitchen and I too can't believe that you just eat because you are supposed too! I was taught to love food by my husband who is Italian and food is very important to them! LOL! I spend a lot of time cooking in the kitchen but I love my living room. Happy October and enjoy your day sweetie. Everyone is talking about soup now, Melanie and I told my husband yesterday that I have such a craving for veggie soup! Now I am definitely going to have to make a batch this weekend. Bean- veggie sounds good. That chair was super easy, trust me, I am not a complicated crafter. I highly recommend that tape. Thanks for peeking and have a great weekend. Well, I love what your husband is doing. That sounds familiar. My spouse likes those two guys with a science show. I don't watch t.v.... almost never. Hi Su! I don’t watch tv either. I will sit with him and read or craft, but I rarely watch. Your kitchen and porch are lovely, I would hang out there, too! Happy October! I love your kitchen so much!! I love the chair!! I would stay in there all the time. Everything about it is gorgeous. I love your kitchen...my living room is one of my favorites to decorate...especially at Christmas. They are goofy shows, BJ…and I thought my kids had questionable tv taste! ;) Thank you for the lovely comment. I think your living room is lovely. You did a super job, it’s very cozy. I’m so glad you came by to say hello, it was a pleasure to visit. Fortunately I enjoy our den...I say fortunately because I am married to another TV watcher who likes for me to "sit" with him. He watches OLD westerns, so it is not too bad :^) I have a pile of books and magazines next to my chair, so I can be entertained as well. 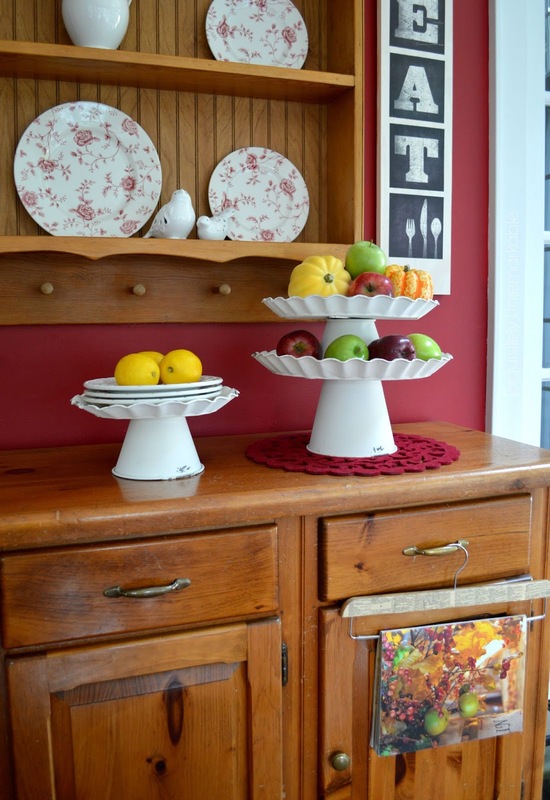 I love your kitchen with it's pretty cabinet and the bright pops of red. I love your kitchen, too and I to don't care to cook. Kim, you have a pretty kitchen! I can understand why you like to stay in there. I use to cook all the time and am going to push myself to get back into the habit. But when the mister is home he likes me to sit and watch tv with him. My favorite room in my house no matter what season, is my kitchen, even if I didn't like to cook, which you know I do ;) For decorating, it's my living room and that's pretty much the only room that's big enough for it. Your kitchen looks wonderful! 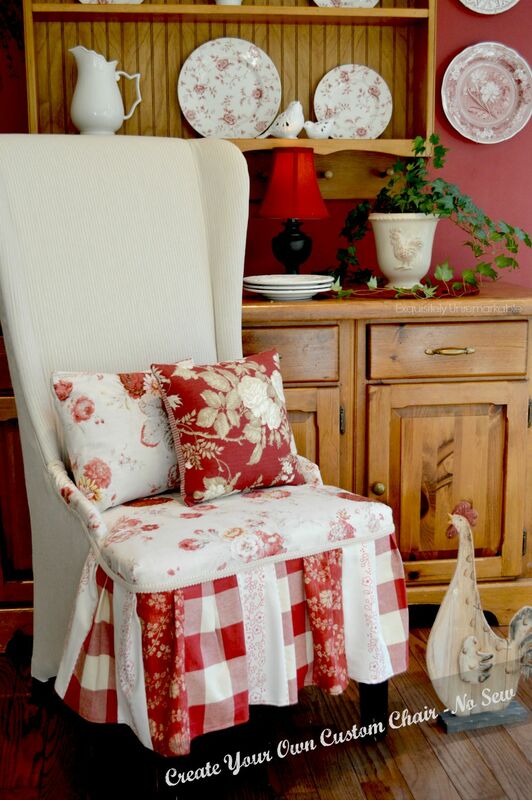 I just love that checked fabric skirt on that chair! Thank you for joining Home Sweet Home! Thanks Sherry! I love that chair, too. Okay...I promise I'm not stalking you...but your kitchen is fabulous! Love every single detail and can I just say how nice it is to finally see someone else with white appliances? :) Oh, and if they create one more "reality" show I'm going to scream! It seems that's the only thing on television these days. Why do men like those so much? So funny! Stalk away, Lisa! You are the sweetest. I am not a fan of stainless. I just want my appliances to fade away, so the rest of the design stands out.